Tantrums and children are two words often said in the same breath.Meltdowns, screaming, stomping and anger are quite universal in the world of parenting. As a parent, I have often turned to books to make my child see reason and to explain how tantrums affect him, and everybody around him. 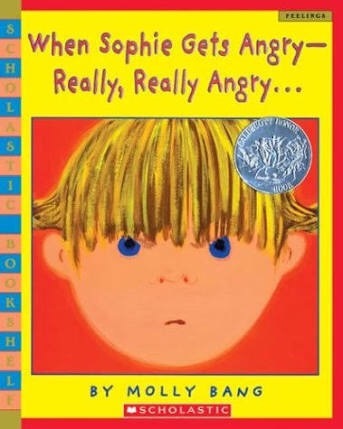 One of my favorite books for tantrum times is the Caldecott award winning book ‘When Sophie gets angry…really, really angry’ by Molly Bang. It is a simple story of Sophie and her sister, who fight over taking turns for playing with a toy, and the mother, in a bid to be fair, takes sides with Sophie’s sister. Sophie doesn’t like it, and quite naturally, gets angry. She has a typical meltdown, but she chooses her own way to deal with it. How – find out when you read the book. What I really like about the book is the way the author leaves the onus of dealing with her anger and feelings on Sophie, and emphasizes that even if you do get angry, your family still loves you as much when your outburst is over. Sophie’s gradual calming down and returning home eventually to find the fought-over toy abandoned is a situation your child can relate to very well. And the book is indeed very simple for the kids to understand, aided wonderfully by the pictures. 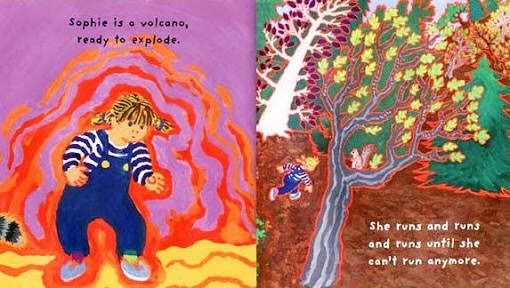 You must notice the way the illustrator (Molly Bang herself) has used the shades of colours and pictures (look out for ‘explode’) to show the anger at its peak, and then the calmed down Sophie with cool, peaceful ones. Just a word of caution though, Sophie’s way of dealing with anger has to be explained to the young kids very well, telling them that they must stay safe, no matter how they choose to deal with their anger. It is a must read book for the parents too – it drives home the point that you need to respect your child’s emotions, and trust them enough to deal with their feelings, while still being around them should they need you. Previous Temper Tantrums- Every parent’s worst nightmare! Expert advice on how to handle them. Next And..Action! Taher Ali Baig-Actor and Director explains how theatre workshops are great for the li’l budding actors!